ACCESS IT ONLINE OR CALL COMPASS MARKETING TO RECEIVE A PRINT COPY. It is available at all authorized Arizona Office of Tourism Visitor Centers throughout Arizona, RV parks/resorts and many RV shows & rallies throughout Arizona and in northern states and Canada. This annual issue is loaded with current information on RVing in Arizona for winter snowbirds, enjoying our warm, sunny desert setting, or summer travelers in the cooler Northern and White Mountain Regions, both enjoying all Arizona has to offer. It includes over 300 RV parks/resorts, RV related services, attractions and Visitor Information Centers, within nine user friendly regions. 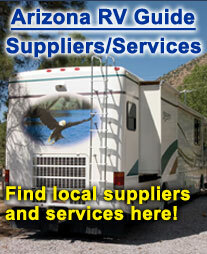 View the entire contents of this proven Resource Guide, serving the RV industry in Arizona, to see it all!